Check out Tobi's Lace It Genuine Suede Dress Loving the leather dresses trend. The Toast Lace It Genuine Suede Dress is made from real suede for a luxe feel. Sleeveless with a deep v neckline and lace up detail, this shift dress adds an edge to a classic shift shape. Worn alone or layered over a long sleeve tee, pair this lace up dress with booties for fall. Loving the leather dresses trend. The Toast Lace It Genuine Suede Dress is made from real suede for a luxe feel. Sleeveless with a deep v neckline and lace up detail, this shift dress adds an edge to a classic shift shape. Worn alone or layered over a long sleeve tee, pair this lace up dress with booties for fall. Loving the leather dresses trend. 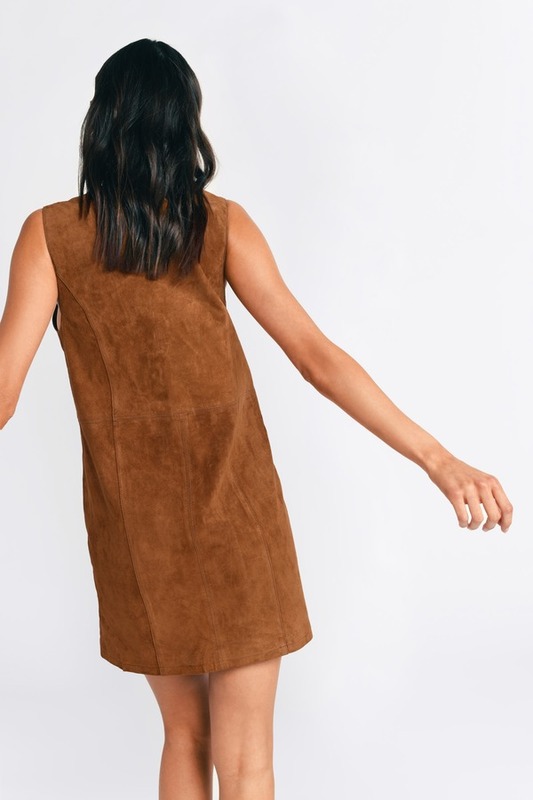 The Camel Lace It Genuine Suede Dress is made from real suede for a luxe feel. Sleeveless with a deep v neckline and lace up detail, this shift dress adds an edge to a classic shift shape. Worn alone or layered over a long sleeve tee, pair this lace up dress with booties for fall.